This celebrated Boston ensemble, devoted to music of the 20th and 21st centuries, celebrates its 20th anniversary this season. Equally laudatory is its burgeoning CD catalogue, a rich and diverse library now essential to any student and admirer of American music. Listening to that bold proclamation, you sense a tongue pressed lightly into a cheek, even if you’re sympathetic to the viewpoint. But for Rose, who still serves as the Project’s artistic director during its 20th-anniversary celebration this season, overturning preconceived notions is serious business. With BMOP (pronounced “BEE-mop” by friends and admirers), Rose has advocated for new and recently new music resoundingly. The orchestra to date has presented more than 100 premieres, as well as 50 illuminating recordings, the majority issued on its house CD label, BMOP/sound, launched in 2008. The stylistic range is equally impressive: BMOP has devoted its spirit and authority to performances of works by Gunther Schuller, Lukas Foss, Lee Hyla, and Milton Babbitt, while also providing welcome exposure for disparate contemporaries like Lisa Bielawa, Ken Ueno, and Andrew Norman. The results speak for themselves: 20 years of achievement and growth, prestigious performances, and a swelling tally of awards and accolades, including 11 ASCAP awards for adventurous orchestral programming. Rose—who served as artistic director of the now-defunct Opera Boston from 2003 to 2011, and currently holds that position with the Boston-based Odyssey Opera and New Hampshire festival Monadnock Music—was awarded an ASCAP Concert Music award, and in 2007 received Columbia University’s Ditson Conductor’s Award for his commitment to the performance of American music. That achievement has not come without its share of challenges, he admits. 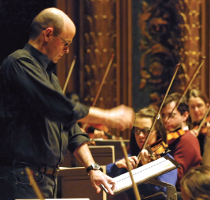 After 20 years, BMOP can boast of attracting some of the youngest, hippest audiences in town—a point made in an illuminating 2007 profile of Rose written by Boston Globe classical-music critic Jeremy Eichler. But in a city richly stocked with cultural opportunities, houses for BMOP’s smartly programmed, vividly played concerts at the New England Conservatory’s Jordan Hall are not always full. And Rose reports that even after 20 years, he meets self-professed new-music lovers in Boston who say they’ve never heard of BMOP. “I hardly spend any money on marketing,” Rose offers. “We put it all up on the stage.” And on CD. Lessons Rose learned as a record-store clerk and as a passionate collector are reflected in the burgeoning BMOP/sound catalog. From the start, the label’s discs have shared a distinctive look, as well as an attention to quality that extends past performance and recording to erudite notes and appealing designs. The result is the natural heir to the storied Louisville Orchestra canon, and a library now essential to any student and admirer of American music. “There’s a whole lot of stuff we record that we don’t even play in concert,” Rose says. “Every June, I do what’s become known among the freelancers as ‘Recordathon.’ The first year was four days, three sessions a day.” At the end of BMOP’s inaugural taping marathon, someone snapped a photograph of empty seats and microphone stands, surrounded by sheet music that blanketed the Jordan Hall stage. “Somebody shared it on Facebook and said it’s like empty bottles of beer after an all-night party,” Rose relates, laughing. This year, he and his players completed a disc devoted to Wayne Peterson’s music, recording his Pulitzer Prize-winning piece The Face of the Night, The Heart of the Dark, and another disc of works by Walter Piston. In addition, the ensemble taped works by Stephen Hartke and Lei Liang, both destined for discs in progress. That small selection points toward the breadth and diversity of music that BMOP has helped to preserve and disseminate—activities at the heart of the organization’s mission. Rose likewise points to the ensemble’s four most recent releases: Andrew Norman’s Play, a 50-minute piece that some critics have proclaimed the first major orchestral work of the 21st century; the complete symphonic works of Irving Fine; a disc of large orchestral works by Donald Crockett; and, most recently, a richly rewarding two-CD set of Lukas Foss’s complete symphonies. Steve Smith is an assistant arts editor at the Boston Globe, overseeing music and visual arts coverage. He previously served as the music editor for Time Out New York and as a freelance contributor to the New York Times, and takes his daughter to concerts and museums as frequently as possible.